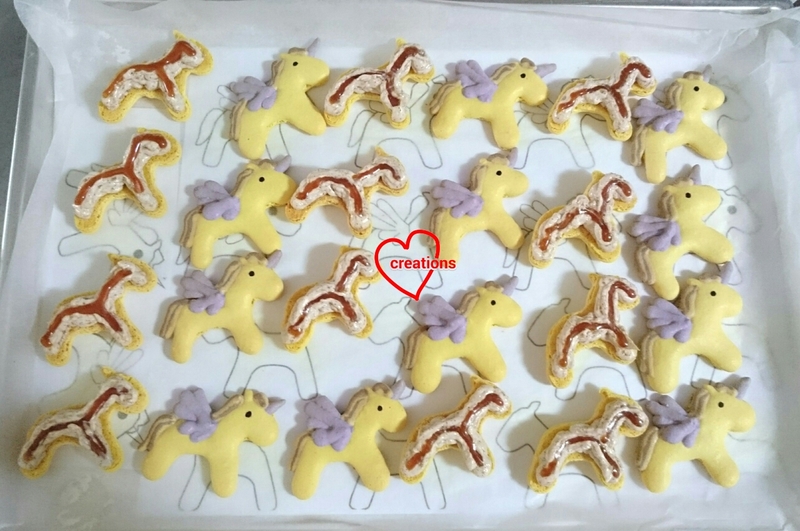 Someone saw my unicorn with shooting stars macarons and loved it so much she wanted some for her birthday! 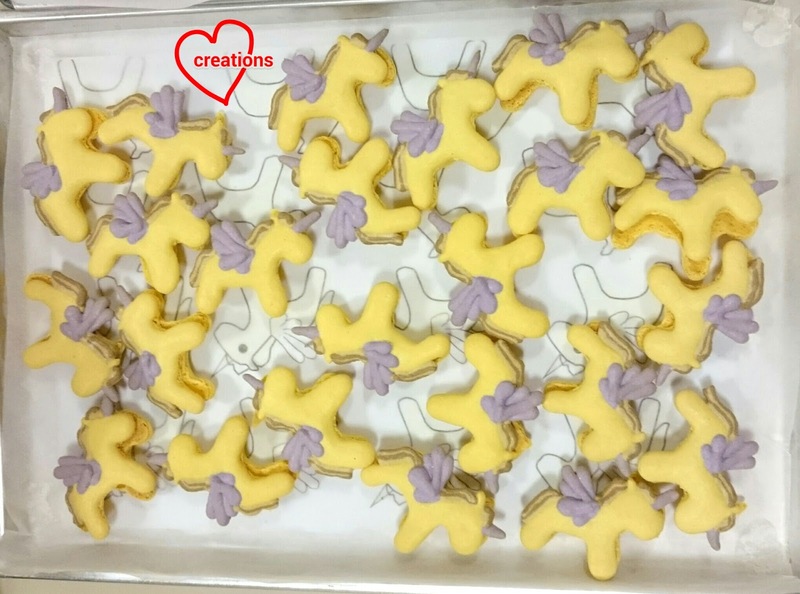 As I was baking these concurrently with another batch of safari themed macarons (will post in near future), I used the colour scheme that was available from the other bake to create these dainty creatures. It's quite a challenge to bake with kids home during the school holidays so I didn't want to stress myself out with too many coloured batter. 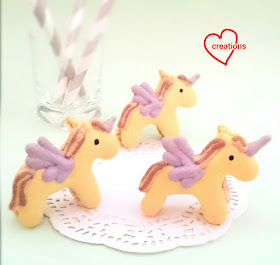 You may find the template for unicorns in my previous unicorn macaron post. I tried as far as possible to use natural food colouring to colour the batter. 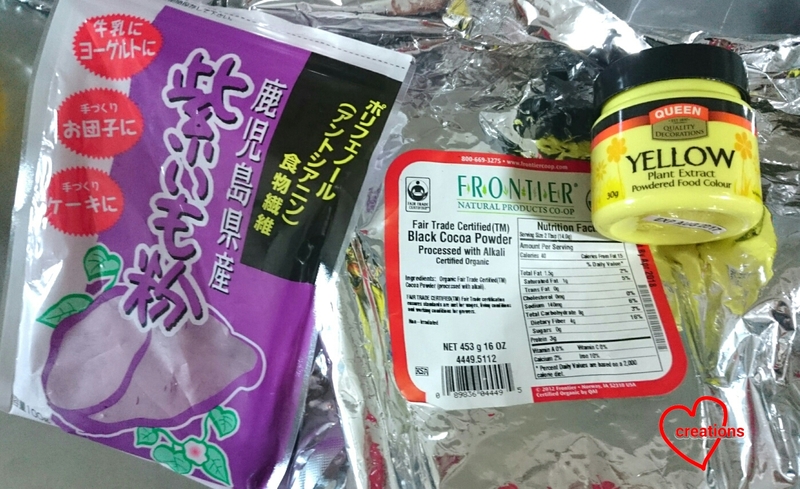 Purple sweet potato powder for purple, natural sourced yellow powder for yellow and cocoa powder for brown. Some artificial colouring is still needed to give a more vibrant shade but less is needed. You may omit the natural food colouring if unavailable. 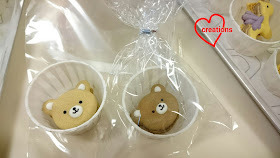 *add about a few grams of powdered natural colouring per 100g of almond. Add a pinch of cocoa powder to colour light brown. Add a little yellow and orange gel food colouring to the brown shades to give the shells a warmer tone. 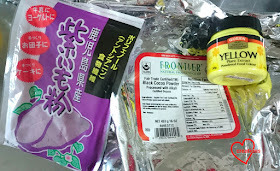 Purple sweet potato powder, Dutch processed cocoa and yellow powder. All natural! 1. Prepare baking trays with A4 paper templates on it. Place a sheet of baking paper on top. Use some Italian meringue to stick the corners of the baking paper down when you have made the meringue. 2. Sift almond and icing sugar together in a large mixing bowl. 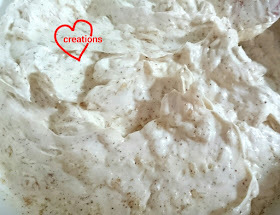 Add half of the egg whites (80g) and mix well until a thick paste forms. This is the mass. 3. Divide the mass into ratio of 12:2:1:1 for yellow: purple:light brown: dark brown. You may simplify things by using one shade of brown. If so, use ratio of 6:1:1 for yellow:purple:brown. I was just using the available colours from my other batch of safari macarons. 4. Make the Italian meringue. In a clean metal bowl, beat 80g of egg whites with an electric mixer at medium-low speed until foamy and opaque. Do not beat past the soft peak stage. Reduce mixer speed if necessary. In the mean time, heat caster sugar and water in a small saucepan until 115°C. Use a candy thermometer to measure the temperature. It's easier to work on the egg whites and syrup simultaneously with a stand mixer but it's possible with handheld mixer as well although what I used to do was to monitor the syrup temperature while whisking the egg whites manually until it's time to pour the syrup in. When temperature is reached, remove saucepan from heat. 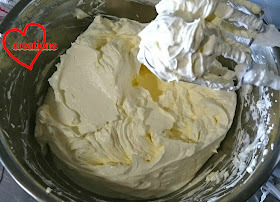 Turn up mixer speed to medium high and carefully pour the syrup into the egg whites, avoiding the beater. Continue beating for another 10 minutes until meringue is stiff, glossy and cool. 5. Divide the Italian meringue into portions according to the ratio above or simply use the formula weight of Italian meringue = weight of mass x 0.55. 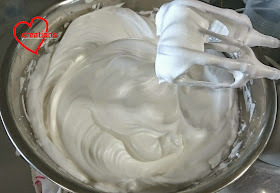 Fold the meringue into the mass in two or three additions using the fold and press motion until batter flows in a slow-moving lava-like way. 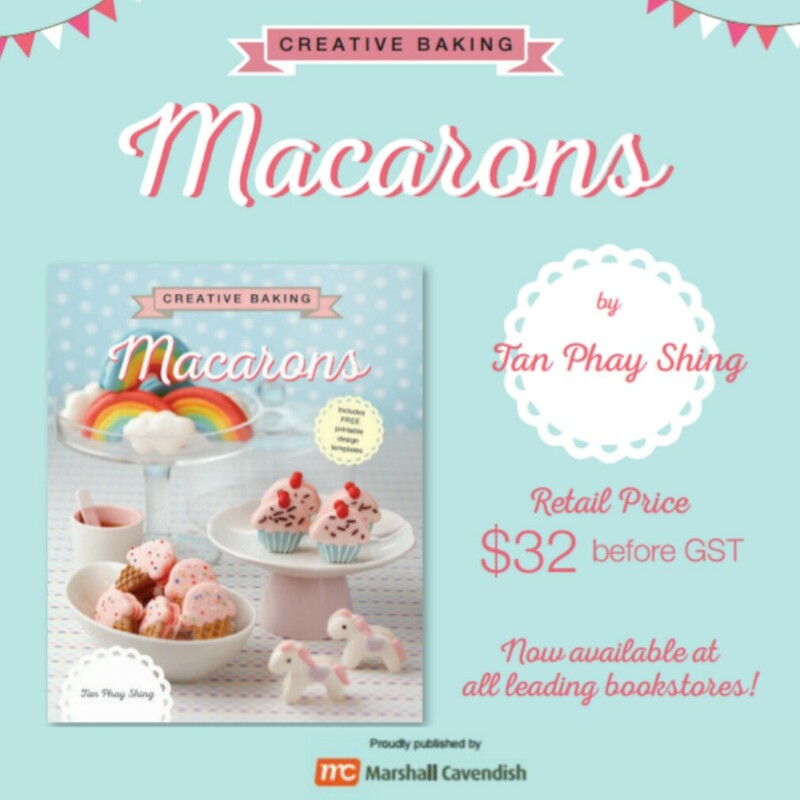 You may refer to this post for video tutorials of macaron basics like how to fold the batter and test the consistency. 6. 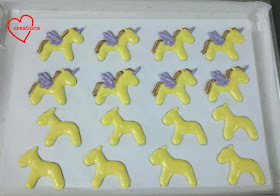 Transfer yellow batter into piping bag fitted with a Wilton #8 tip (about 4-5mm). 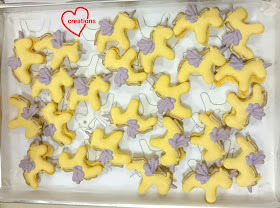 Transfer the purple batter into piping bags fitted with Wilton #5 tip. Transfer the brown batters into piping bags fitted with Wilton #4 tip. 7. Pipe the batter onto baking tray. You may refer to this post for video tutorials on piping complex shapes. 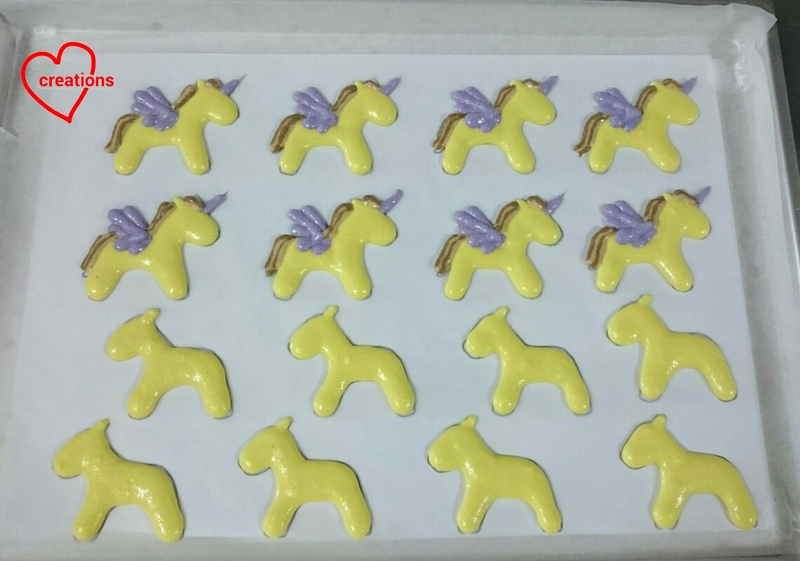 Remember to bang the tray on the table a few times after piping to release trapped air bubbles and flatten any peaks. I had to use the toothpick often for these intricate macarons. 8. Dry the piped shells for 1-2 hours in air-conditioned room or under a fan until the shells are dry to touch when you run a finger across the surface. Preheat oven to 135°C towards end of drying time. Set oven rack to lowest position. 9. Bake for 10 minutes and rotate the tray. Bake for another 7-8 minutes before checking on the shells. If the feet appear wet, bake for another 5 minutes at 120°C and check again. Cool the shells on the tray before gently peeling the baking sheet away from the shells. Use edible black marker to add on the eyes. Check out the awesome feet up close! 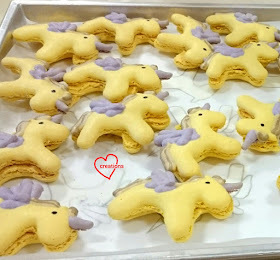 I filled these with spiced apple Swiss meringue buttercream and salted caramel. I updated both recipes a little so will type out in detail here. 1. Make applesauce. Place all ingredients for applesauce in a small saucepan. Cook over low heat, stirring often until liquid is reduced. About 20 minutes. 2. Heat about 1" of water in a deep saucepan with low heat. Place egg whites, salt and sugar in a heatproof bowl that can fit over the mouth of the saucepan without the base touching the water. Place the bowl on top of the saucepan. Use a hand whisk or a hand held electric mixer to whisk the egg whites until foamy and temperature reaches 71.1°C and all sugar has dissolved. Be careful to keep moving the egg whites. About 5-6 minutes. 3. Remove bowl from heat. Use an electric mixer and beat the egg whites at high speed until stiff, glossy and cooled to room temperature. About 10 minutes. I place a damp towel under the bowl with a standing fan blowing at the bowl to speed up the cooling process. Use a spatula to scrape off the sides of the bowl now and then to ensure even beating of the egg whites. 4. When the meringue has cooled (I use the candy thermometer to check temperature of meringue deep within the pile), add butter one cube at a time and beat at medium speed. Don't worry if it appears to curdle. Just keep beating and gradually adding each piece of butter until it is well incorporated. Increase speed when all butter has been added and beat for another minute or two until fluffy. Add vanilla and beat until well combined. 5. Gradually add applesauce (about 65g) to smbc and mix well. You may store this in the freezer and thaw and re-whip before use. 1. Place sugar and water in a deep light coloured saucepan. Heat over medium heat, you may swirl the pan to help the sugar dissolve but don't stir. 2. Meanwhile heat cream and vanilla in a small saucepan until bubbles appear. Set aside. 3. 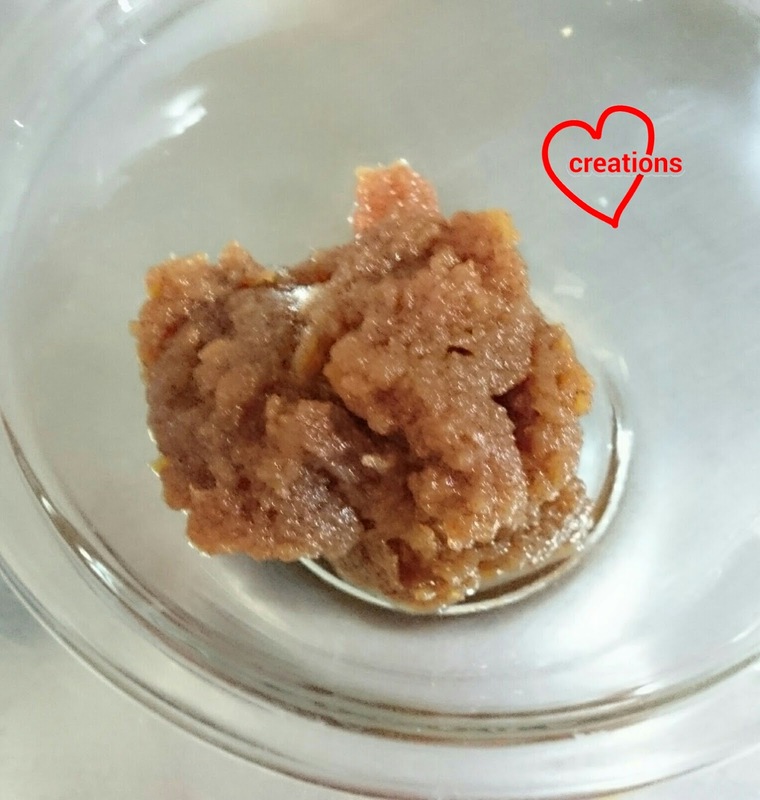 When the sugar solution turns amber, remove from heat and slowly pour the cream in and stirring continuously with a long wooden spoon. The mixture will bubble violently so be careful. Don't panic. Just keep stirring and it will calm down. 4. Add unsalted butter and stir until combined. Add salt and stir. You may use the caramel once it has cooled to room temperature or you may store in the fridge/freezer. Let it come to room temperature before using. Pipe the spiced apple smbc onto the bottom shells. Add some salted caramel before placing the top shell on. Refrigerate for at least 24h before serving. I had leftover batter for brown so I made these bears! Enjoy! 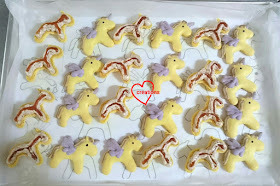 My kids got to eat some extras and they loved it! It's one of my macaron fillings that's bursting with flavour and homemade goodness! Hi, thanks for your encouragement! 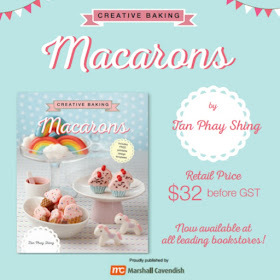 The book is only available in English but it's available on Book Depository and Amazon.